Phase 1 of the Project leveraged advisory groups comprised of governmental partners and agencies that have jurisdiction or regulatory authority within the project area. These groups met on multiple occasions to provide policy-level feedback, represent interests of their constituents, assist in review of technical materials, and consider a shared funding and governance model. 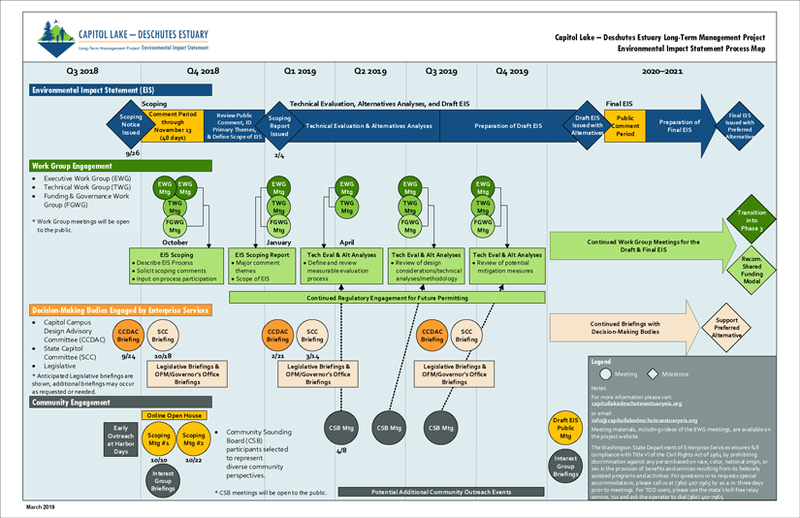 For Phase 2 (EIS), the project team developed a process map that illustrates how these groups will continue to be engaged throughout the EIS process, in an advisory capacity. Work Group meetings are open to the public and information about upcoming and past meetings is posted on the Meetings page. Information on the Community Sounding Board can be found on the Get Involved page. This map graphically depicts the sequence and timing of engagement with the project advisory groups, decision-making bodies and the community. The Process Map demonstrates the commitment to a robust and inclusive process, which will supplement the standard SEPA process. The Process Map will be updated with additional detail as the project progresses – it is a living document. The EWG includes representation from governmental partners. The members provide policy-level feedback to the Project and represent the interest of their constituents. They are tasked with providing a comprehensive view of the project issues, considering policy, community, and technical aspects, and remaining amendable to feedback from other interested parties. EWG members may be supported by additional staff to ensure capacity, availability and the ability to collaborate internally; however, advisory functions will only be served by the primary Work Group member. Video recordings of these meetings are available on the meetings page. The TWG includes representation from the resource agencies, affected Tribes, and other entities that would have regulatory/permitting authority in Phase 3, or would require close coordination regarding potential mitigation measures. Members have been identified by Enterprise Services or the EWG, and may be supplemented by additional regulatory/permitting entities if determined necessary. TWG members provide natural resources and permitting expertise and technical review of project material and issues related to long-term management of Capitol Lake – Deschutes Estuary. DES convened the FGWG to fulfill legislative proviso elements regarding identification of a conceptual option for shared funding and governance for long-term management of Capitol Lake – Deschutes Estuary. The FGWG is comprised of taxing authorities or taxing districts in the project area. The Washington State Department of Natural Resources also has special interest in the governance discussion given its legal responsibility to manage state-owned aquatic lands, such as the Capitol Lake – Deschutes Estuary. In 2016, the FGWG identified shared goals or attributes of a potential shared funding and governance model and committed to continuing the work to evaluate and develop a potential funding and governance model for Phase 3. The CCDAC is an advisory committee to the State Capitol Committee (SCC) and Enterprise Services. The committee provides administrative and technical recommendations to both SCC and Enterprise Services to achieve and maintain the highest level of design excellence and appropriate level of maintenance of the State Capitol Campus. CCDAC also provides guidance relative to potential impacts that campus may have to the established visions, goals, and objectives outlined in the comprehensive plans for Olympia, Lacey, Tumwater, and Thurston County. For information on members and meeting materials visit the Committee’s web page . The SCC provides policy direction to Enterprise Services for the short and long-term stewardship, preservation, operation, and maintenance of the state’s public and historic facilities, and approves master planning efforts on the State Capitol Campus. Additionally, the SCC is responsible for approving the acquisition and use of property located in Thurston County by the State of Washington. The project team provides briefings to state legislators and the Office of the Governor in parallel with other advisory group meetings and key milestones. The State Legislature and the Office of the Governor provide ongoing representation of the interests of local and state citizens, and may have an active role in project implementation in Phase 3.